“Whether it is a meal for two or your whole extended family, White Fence Farm not only serves the best chicken, but T-bone steaks, shrimp, and much more. Don’t forget about our farm fresh desserts available in the restaurant or in Granny’s Sweet Shop.” (Jeff loves their cherry pie) They also feature live music every night in the “Americana Barn”, if you are feeling so inclined. 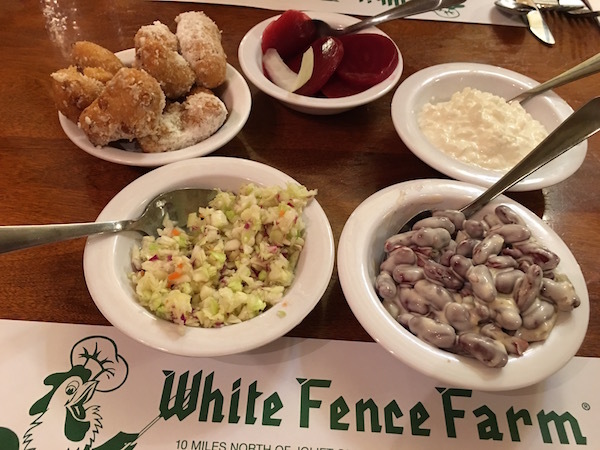 The White Fence Farm serves all the sides family style and I think they have the best kidney bean salad. Here is the recipe, hope you enjoy! Mix mayonnaise, oil vinegar, sugar, salt and pepper. Add onions and stir well. Then add the celery, beans and relish.